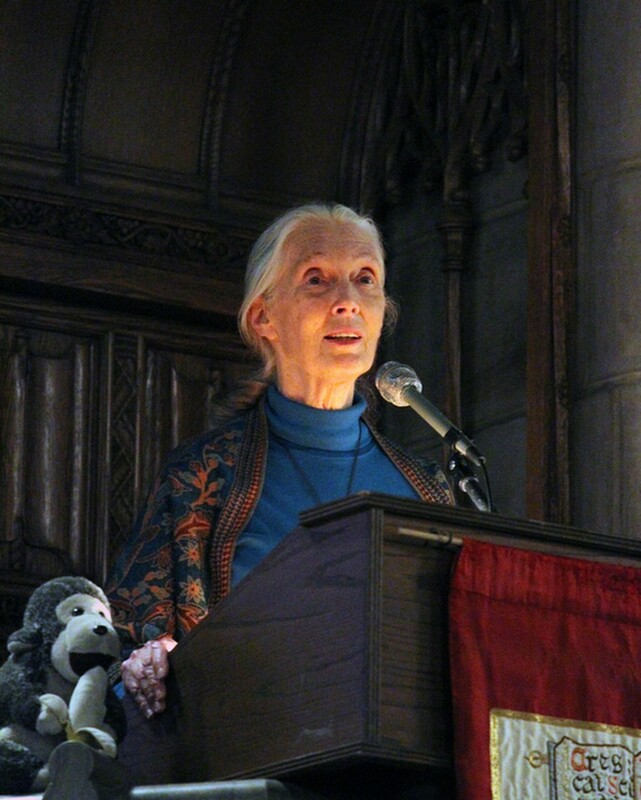 Internationally renowned primate researcher and environmental activist Jane Goodall spoke to a packed Rockefeller Chapel Friday about the need to stop “battling” our planet. Goodall described her conservation work with animals and her work with degraded forests in central Africa. She also discussed her early fascination with animals and reflected on her first experiences in Africa exactly 50 years ago. According to Goodall, having no background in scientific research turned out to be an advantage. The unconventional ways she looked at animals—such as giving her chimpanzees names like Goliath and David Greybeard instead of numbers, and acknowledging their individual personalities—led to important anthropological discoveries. After getting a Ph.D. in ethology from Cambridge and studying Africa’s wildlife, Goodall made a career switch in 1986 when she attended a Chicago Academy of Science conference on conservation. “I came out as an activist and since then I haven’t stayed in the same place for more than three weeks,” said Goodall, who has since been named United Nations Messenger of Peace and Dame of the British Empire. As Goodall learned more about environmental issues, she invested more effort in her Jane Goodall Institute (JGI) that now provides microcredit and scholarships for girls, family planning and AIDS education resources, and assistance for African farmers selling coffee. “Poverty is one of the most terrible destroyers of the natural world. If you have a family to feed, you’re not going to care about cutting down trees for food,” Goodall said, adding that JGI started the global grassroots program Roots and Shoots to promote sustainability in developing areas. Fifteen-year-old Indiana native Laura Gibson spoke during the talk about how Goodall influenced her to start a local Roots and Shoots program to help her area. “To me, Roots and Shoots is giving the confidence, inspiration, and tools to change our world for the better,” said Gibson, who is now involved in the organization’s national office. Roots and Shoots has been able to expand its influence to 120 countries as conservation and sustainability have become larger issues. “There is a growing awareness that we really have harmed the planet, and it’s time we get together and do something about it,” Goodall said.